The Music service run 13 free ensembles to ensure there are extensive opportunities for all String, Woodwind, Brass, Percussion and Guitar players. We also have the very popular Azaad Dhol Group. These cater for all standards from those just starting their musical journey right the way through to Grade 8. Groups rehearse weekly and all perform regularly in concerts/events. 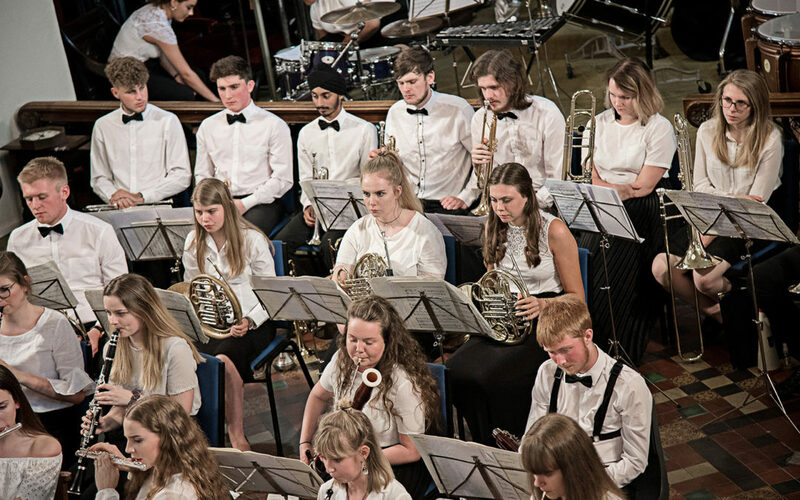 The prestigious and highly respected Youth Orchestra and Youth Wind Orchestra also undertake a high-profile summer music tour abroad. Many of our students go on to join regional and national ensembles such as NYO, NYJO etc. The Wolverhampton Youth Music Theatre is yet another resource for the talented students of the city and is renowned for the superb quality of its’ Musical productions. We also provide bespoke additional events such as Sing for Summer & Singing in the Rain catering for our younger vocalists, and for contemporary musicians we have the Rockschool Holiday courses. We run additional day long courses for groups of instruments working with visiting musicians, as well as organising exciting events around the BBC Ten Pieces initiative. For more information please see our Ensembles page, explore the website and visit our Facebook Page.